The Filthy Dubstep lads in Limerick Blew the roof off the house with over 200 in attendance for their second gig, a feat in itself!! Shouts to all the lads for a serious night and their hospitality. Tonight we are preparing for the Culture Clash. 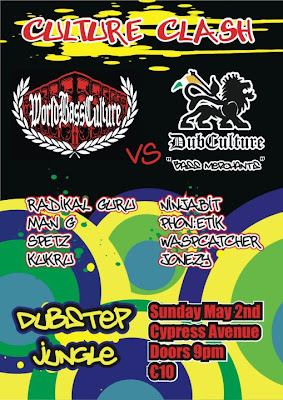 DubCulture VS World Bass Culture in Cypress Avenue from 9pm. Expect a back to back whirlwind with each crew member on four tune rotation...see you there!